Graduation day is always full of special honors and recognition for those amazing students who have gone above and beyond academic expectations. The Psi Chi International Honor Society, which recognizes students for special achievements in psychology, utilizes a platinum and dark blue, intertwined, double cord with a mixed tassel to honor their recognized members. A Psi Chi honor cord can symbolize not only what your students have already achieved, but also all your hopes for their bright futures as they continue forward with their careers and their education. We do not currently carry honor cords that coordinate with the Psi Chi International Honor Society traditional graduation cords, but we do carry navy cords and silver cords which could work very nicely. Please continue to check back, or contact us and we will try to accommodate your honor cord needs as best we can. The Psi Chi International Honor Society works to encourage students as they work through their chosen field in psychology, and recognizes their talents and success along the way. By awarding the Psi Chi honor cord, you are offering your graduates a connection to a long-standing tradition of honor and effort, and providing them with more opportunities to succeed both academically and professionally. The Psi Chi honor cord also represents the growth and development of your graduates' creativity in both an academic and professional setting. The Psi Chi International Honor Society encourages students to think beyond the normal expectations of their profession and to seek instead to look at things in a new light. With Psi Chi graduation cords, your students will feel the full weight of their success at their commencement ceremony, and will cherish the memory of their academic experiences for the rest of their lives. 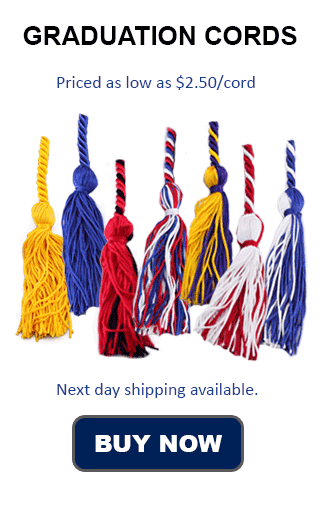 Against the backdrop of a traditional black graduation robe, Psi Chi graduation ropes will pop and draw attention to the graduates and their special success, providing the perfect finishing touch for any successful psychology major. Make the Psi Chi International Honor Society a part of your commencement and ensure that your students receive their due recognition by rewarding deserving graduates with the platinum and dark blue graduation cord.